A family day out at Mead Open Farm offers lots of opportunities to get to know our animals. A daily schedule of animal fun activities means everyone, no matter what age, has a chance to learn about, touch and feed farm animals and pets. On your day out at Mead Open Farm, can you help the farmer bottle-feed Mead Open Farm’s older lambs? 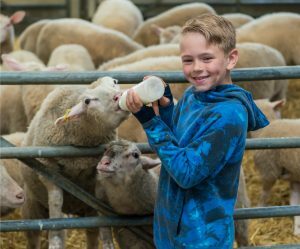 Twice daily in the Demo Barn, all year round, bottle feeding our lambs will get you really close to the animals and is a great experience as part of your day out on the Farm. The eager lambs love to be bottle fed and with some being a little bit greedy, you’d better hold on tight to the bottle! Who can resist a soft cuddly bunny? Three times daily in the Big Barn, our bunnies come out to give you the softest hands-on experience! Running freely on our special Bunny Hop tables, the rabbits are at exactly the right height for children to stroke and see up close, and our friendly staff are available to tell you all about them – so go and find out more about your favourite bunny! A must for all young pony enthusiasts! Daily at Mead Open Farm, children can help the farmer to make sure the ponies are smart and well brushed. The ponies love the attention at this daily grooming and petting session. Find out more about chickens – hold them, stroke them, see the eggs they have laid and learn all about what they eat and what they need to stay healthy, happy, and to produce lovely eggs. Join our Farmer for the Chicken Chat twice daily in Big Barn. There’s more to know about chickens than you realise! Newborns aren’t just for springtime! All year round at Mead Open Farm, new baby animals are being born. From baby alpacas and calves to pygmy goats and piglets, there are always adorable babies to get to know at the Farm. And from February to April there is always lots to see and marvel at in the Lamb Nursery as our pregnant ewes give birth to fluffy, bouncy and very mischievous lambs! Enjoy an extra special farm experience with all of Mead Open Farm’s hands-on animal activities. Click here to see what’s on at Mead Open Farm. Don’t forget, many of the activities take place under cover in one of our four Animal Barns – so we never mind the rain!